On Writing: Why Planning Beats Seat-Of-Your-Pants Every Time Stop Saying “Diversity”. Start Writing VARIETY! One of the most popular and “evergreen” posts on B2W is How To Put Together A Writer’s CV / Resume, so when Michael got in touch about writing a new post on this, I jumped at the chance! Here’s some great pointers on what to put on yours … Good luck with your submissions! Nowadays, having a well-thought out resume that is able to showcase your skills and traits as a screenwriter in the best possible light is an absolute necessity. Although some would dismiss the idea and point out that one’s work speaks for itself, let us remind you that you would be hard-pressed to find an employer willing to go through an entire script you have written, just so they get an idea of how good you are. The fact that you will be facing some stiff competition and the limitations in terms of word count make it all more difficult to stand out from the crowd. 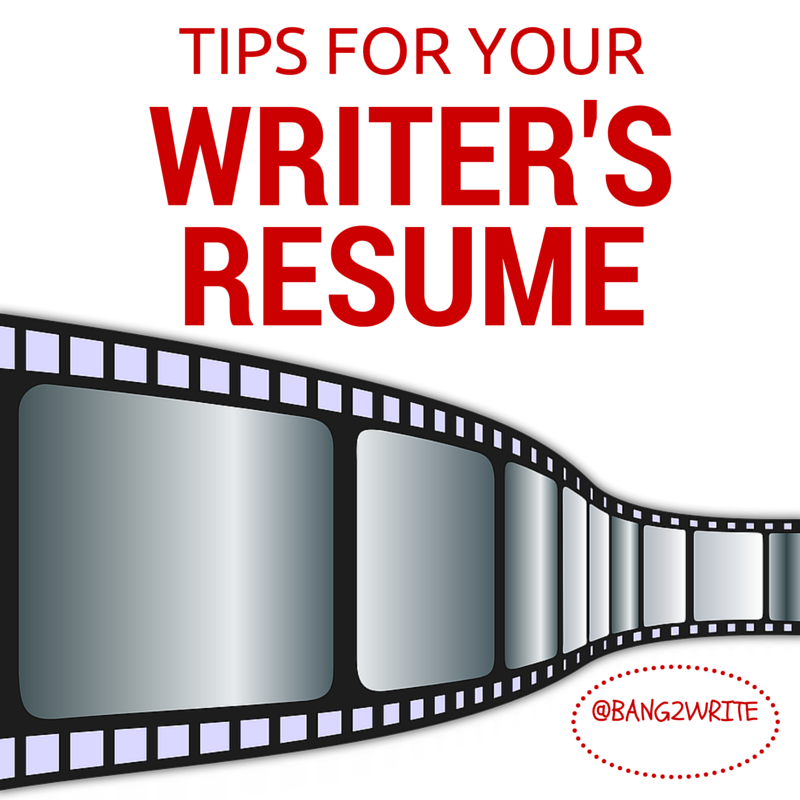 Fortunately, we have created a list of 5 essential ingredients needed to write a brilliant screenplay writer’s resume to help you with that. Pay special attention to the writing on the resume itself. Nothing will get you eliminated as fast as having typos or grammar/stylistic errors. Always write your own resume, because no matter how good someone is at putting resumes together, they won’t be able to convey your own unique voice and style. We also advise you to use editing tools. These will not only spot and correct even the rarest of errors, but will also provide you with suggestions on how you can tighten up your writing and make it more readable. Sharing your Facebook fan page, your website/blog, or your Twitter and LinkedIn accounts as well as your IMDb profile is something that can launch your resume to the top of the heap in an instant. Moreover, if your screenplay happens to find its way onto the screens, your employers will be more than willing to take advantage of your social media accounts to spread the word about it. It’s another weapon in your arsenal, so make sure to use it when an opportunity presents itself. List your credits – We recommend limiting yourself to no more than three screenplays that were filmed. Mention the name of the director, the production company, the year it was filmed, as well as the names of any well-known actors attached to the project. If you don’t have any high-profile scripts that were made into movies, TV shows, or shorts, but you have a large body of work nonetheless, mention how many screenplays you have written. Mention your formal education – Mind you, only list your degree if it is in some way related to your current job as a screenplay writer. If you went to film school, majored in literature, history, arts, journalism, or creative writing, by all means list it on your resume. Display your writing outside the industry – This one could be really helpful if you are not already an established screenwriter with many credits to your name. If you have written a book, or a novel, or perhaps some short stories, if you are running a blog, or if you have experience as a magazine contributor or a journalist, this is the opportunity to let your potential employer know. List unique qualifications – If you have come across a screenwriting job that involves writing a script about a certain location or a profession, and you have lived there, or done the job in question, make sure to list it on your resume. For example, if you need to write a screenplay for a short that takes place in hospital, and you happened to work as a medic in the past, it would be really helpful to write it down. Mention other skills – If you have any skills that might be relevant to the job you are applying for, list those as well. If it’s a particular software suite you are familiar with, or any of the digital tools used for screenplay writing, mention those, too. If you are really serious about making your resume stand out visually, check out Doyoubuzz, which can help you create a tasteful resume without getting over the top, and making it look too colorful. You can choose from a variety of different templates and find one you like best, whether it’s for submission in digital, or printed form. Another way to make yourself stand out would be to create a video resume. Video is a lot more digestible than text, and it leaves a more lasting impression. In addition to that, you can also include some of the video reels from movies or shorts that were filmed based on your screenplay. If you are not very experienced with creating videos, give Animoto a shot. It’s really easy to use, and it produces professional results. Creating a perfect screenplay writer’s resume takes a lot of work. But, it’s not just about the quality of your writing. Seeing as we live in a digital age, enriching your resume with items such as your social media profiles, blogs, as well as inserting graphics and multimedia is the next logical step. Another proof of this is the need to keep everything short and crisp, as time becomes more and more precious, which also applies when you are putting together a resume, regardless of the number of credits or skills you have to your name. Last, but not least, stiff competition requires you to put in more effort and time into creating your CV, but it’s more of a blessing, than a curse, because there are less limitations and more emphasis on individuality. Make the most of it. BIO: Micheal is a resume writing specialist by day. He’s psyched about marketing, business, blogging and SMM. In his parallel life, he loves hiking and can’t wait to see the Himalayas. Follow him on Twitter and Facebook.